My favorite technical book of the year is now available for purchase. 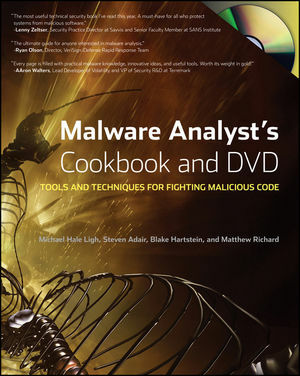 It’s called Malware Analyst’s Cookbook and DVD. The book was authored by Michael Ligh, Steven Adair, Blake Hartstein and Matthew Richard. Having reviewed the draft version of the text, I loved the numerous practical tips that the authors provided for understanding and combating malware. The book doesn’t rehash existing knowledge of the topic, but introduces numerous original tools and approaches. The DVD that comes with the text provides lots of useful scripts and tools not available anywhere else. I will definitely be recommending the book to the students of my malware analysis course as a way of continuing to learn about the topic. I am grateful for the generosity with which the authoring team shared their malware expertise and tools. Well done!